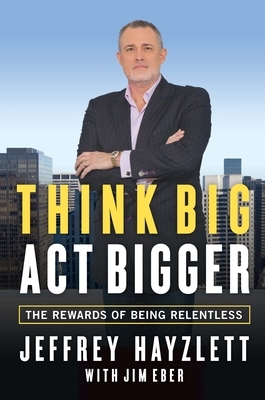 Global business celebrity and prime-time Bloomberg Television host, Jeffrey W. Hayzlett empowers business leaders to tie their visions to actions, advancing themselves past competitors and closer to their business dream. Drawing upon his own business back stories including his time as CMO of Kodak and sharing examples from the many leaders featured on "The C-Suite with Jeffrey Hayzlett," Hayzlett imparts ten core lessons that dare readers to own who they are as a leader and/or company, define where they want to go, and fearlessly do what it takes to get there--caring less about conventional wisdom, re-framing limitations, and steamrolling obstacles as they go. Jeffrey W. Hayzlett is a global business celebrity and speaker, author, contributing editor and host of C-Suite with Jeffrey Hayzlett on Bloomberg Television. He is the CEO of The Hayzlett Group, an international consulting company focused on leading change and developing high growth companies. He lives in Sioux Falls, SD. Find him at twitter.com/jeffreyhayzlett and facebook.com/Jeffrey.Hayzlett. Jim Eber is a veteran marketing writer and collaborator specializing in business and food. He has worked with many new and established authors on projects and served as writer on the best-selling The Mirror Test: Is Your Business Really Breathing? He lives in Worcester, MA.